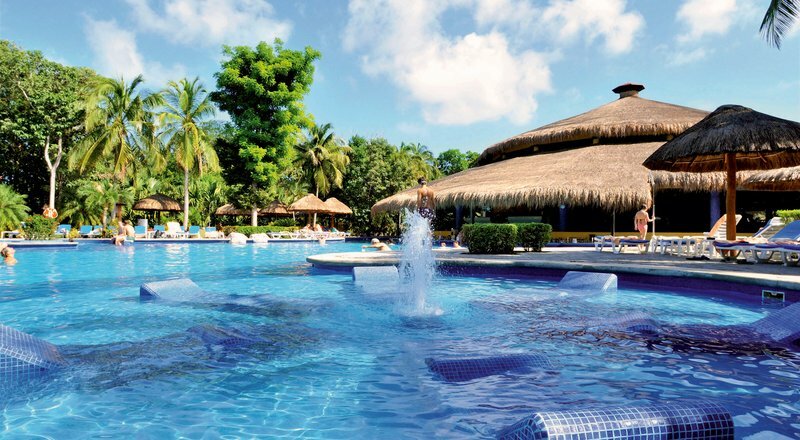 The Hotel Riu Tequila, has a fun and relaxing atmosphere. This family-friendly resort offers a great vacation value and is perfect for friends and family. Surrounded by lush tropical landscaping and is just a short distance from the beach, a trolley shuttle winds through gardens past a raised gazebo on the way to the bar at the beach. This hotel has 664 rooms and all have a mini-bar and liquor dispenser, safe and a terrace or balcony. There is a fee for WiFi in the room however in the lobby it is free. The 4 restaurants give you a choice of the buffet and live cooking stations at the “Beach Club”, dinner at “Jalisco” restaurant with special evenings themed buffet (three times a week), Asian restaurant (buffet), Grill and steakhouse (à la carte), Mexican restaurant (à la carte; buffet starters and dessert) at the “Beach Club”, Snacks 24 hours a day. For additional lunches and snacks, free choice from a selection of restaurants in the Riu Tequila, RiuPlayacar and RIU Yucatan. Four bars including a swim up bar. The resort has a children’s pool and two pools with an artificial beach. The kids will also be entertained in the RIULand mini-club and will enjoy the playground where they will meet new friends. Non-motorized water sports are included. After a long day head to the spa where you have your choice of treatments to relax you. Every evening live entertainment and music provide the perfect show and if you want to dance the night away head to the disco.